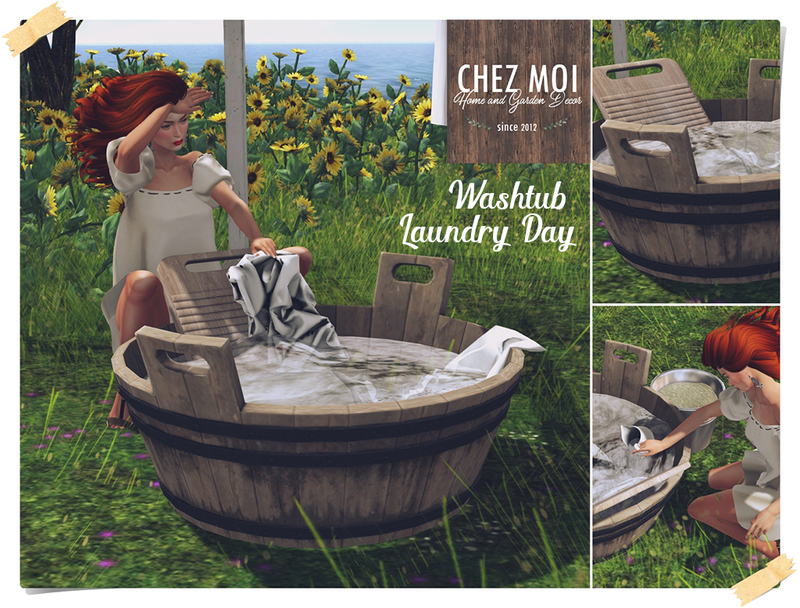 Leave the stress behind and enjoy a relaxing day with CHEZ MOI. 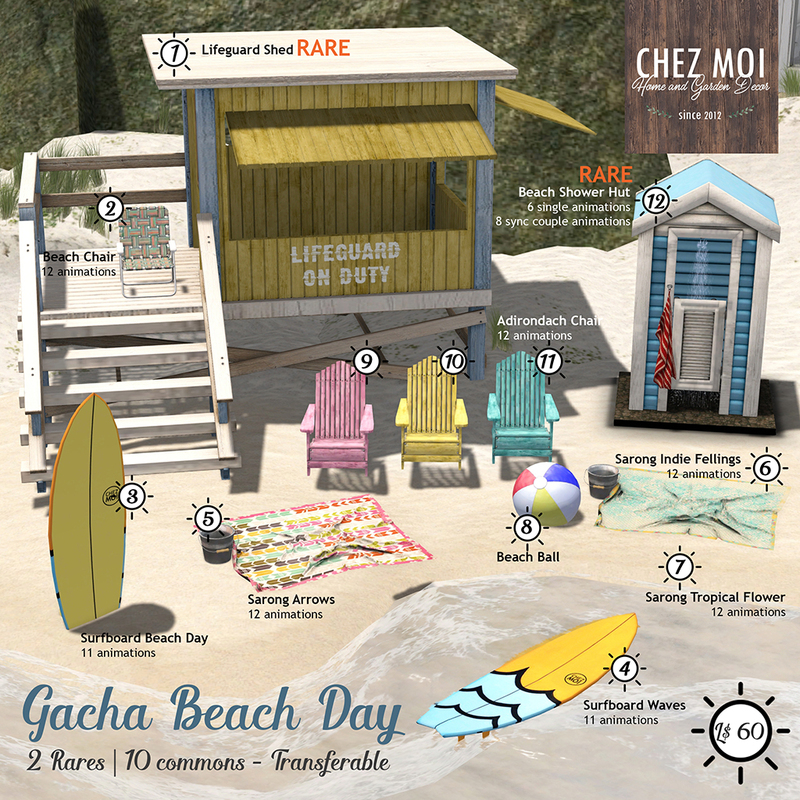 For the Summer round of The Gacha Garden, CHEZ MOI created the amazing GACHA BEACH DAY. There are 10 commons and 2 Rares. Only L$ 60 each pull. The Gacha Garden is up from August 1st to 30th. 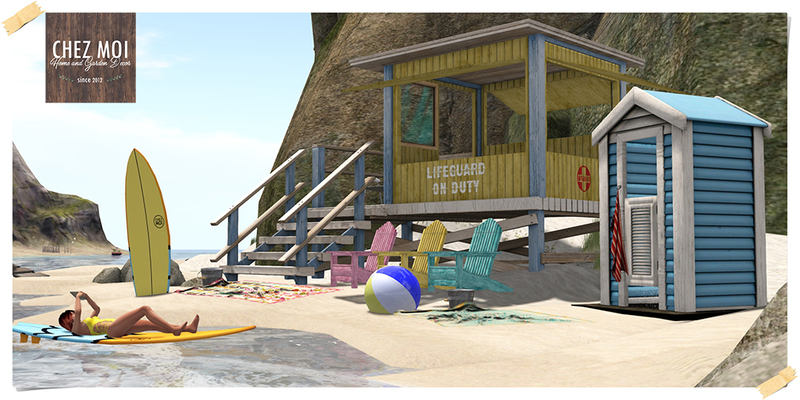 Sand and sun, Summer has begun! 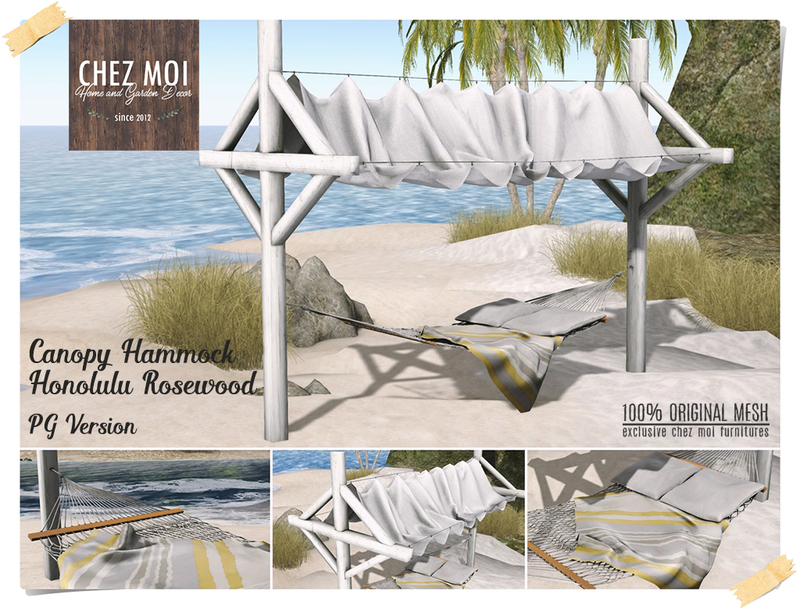 So, enjoy a sunny day, laying down and chilling out with this interactive, fully detailed hammock. 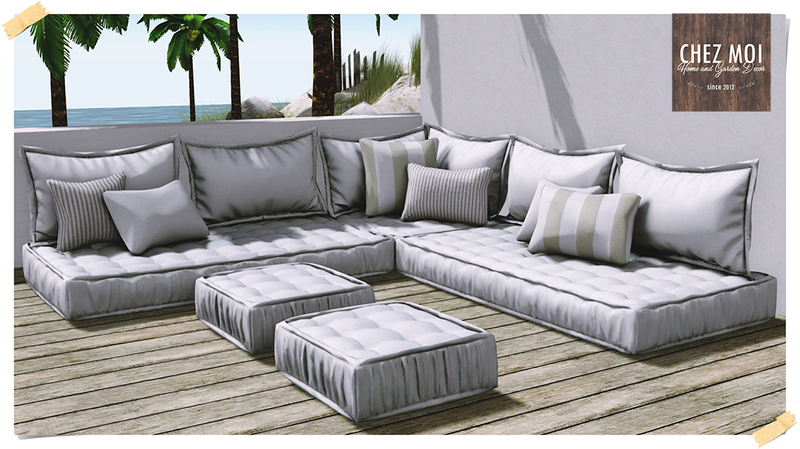 The set is grouped (not linked) to allow you to place anywhere you wish (between trees or palms for example). 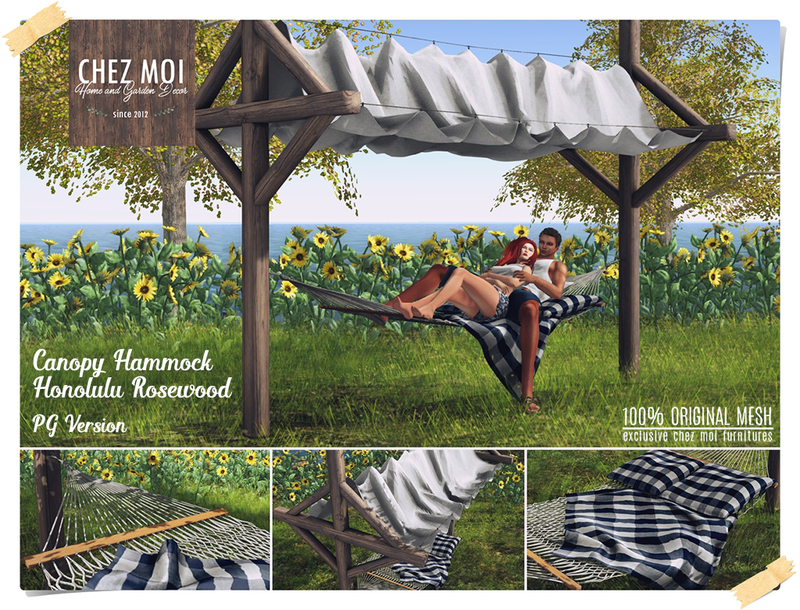 Turn on and off the swing motion by touching an invisible prim at the top of the hammock. 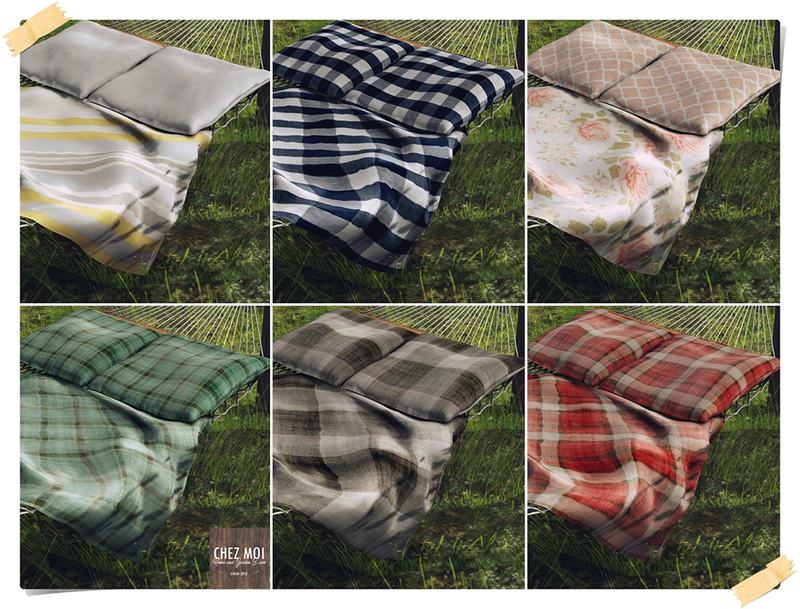 ♥ Texture change options: touch the blanket to display the texture menu. Available for sale in Wood and White versions – both in Adult or PG. 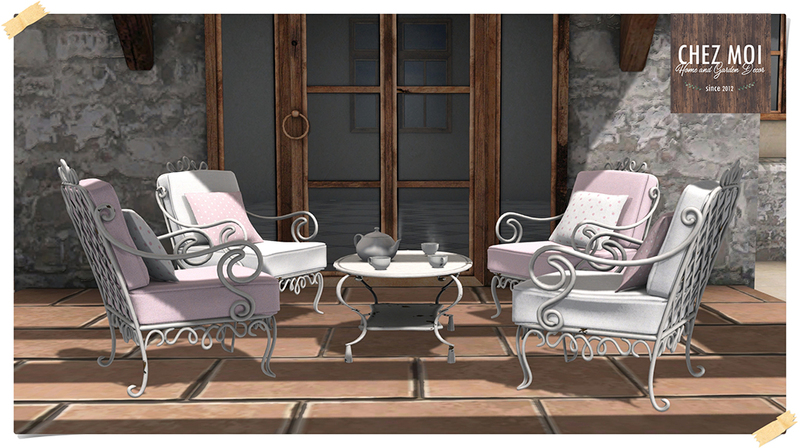 This elegant wrought iron style patio set is perfect for any outdoor space, like balconies, patio, gardens or backyards. 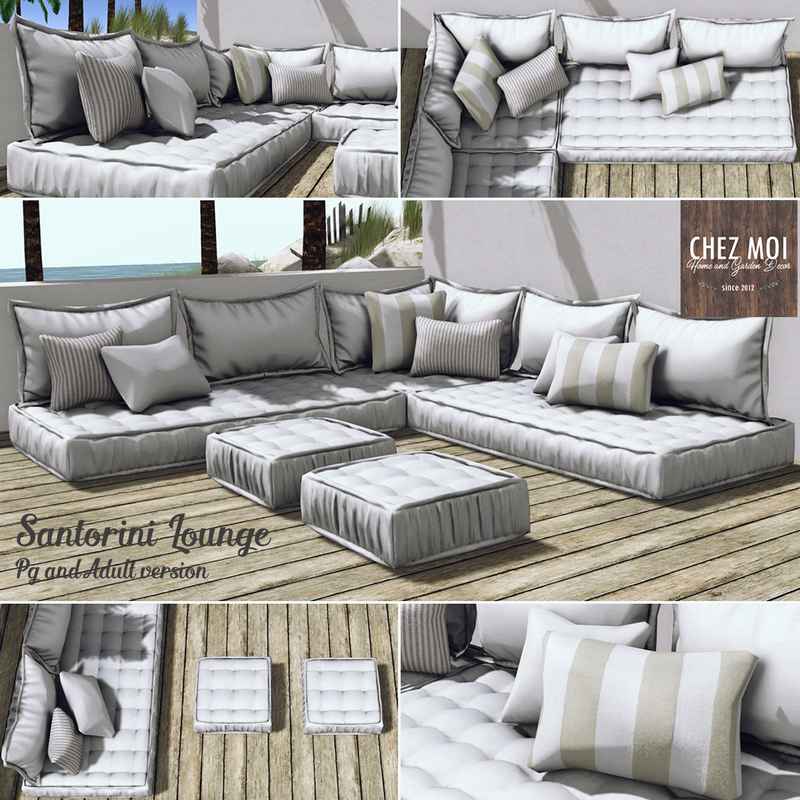 Texture change options: Tap the Chair to display the color menu. There are 18 combinations to choose. 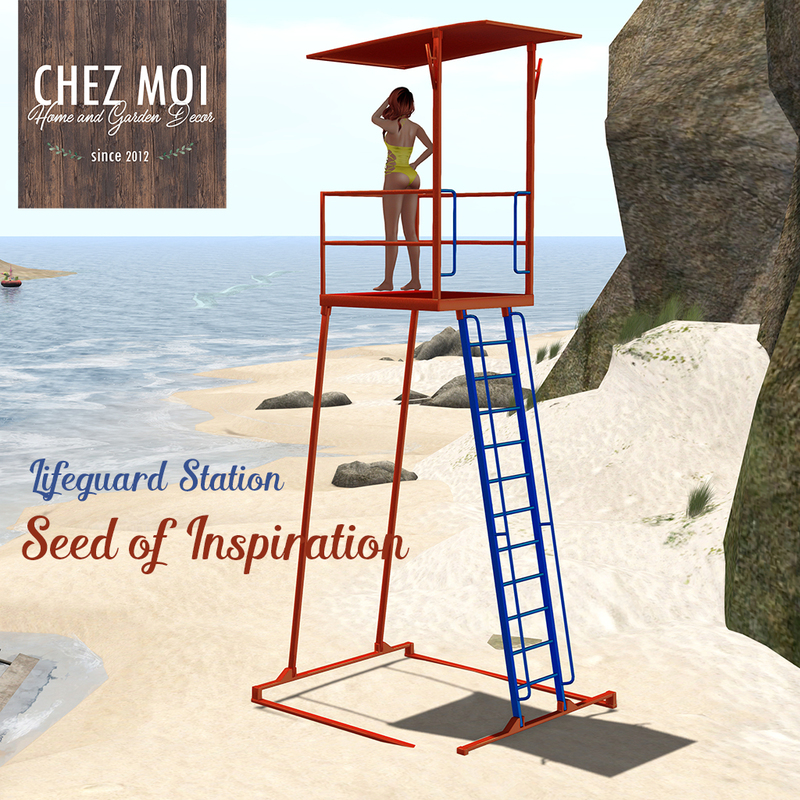 This release is available on CHEZ MOI MARKETPLACE, or visit our INWORLD STORE for a closer look. 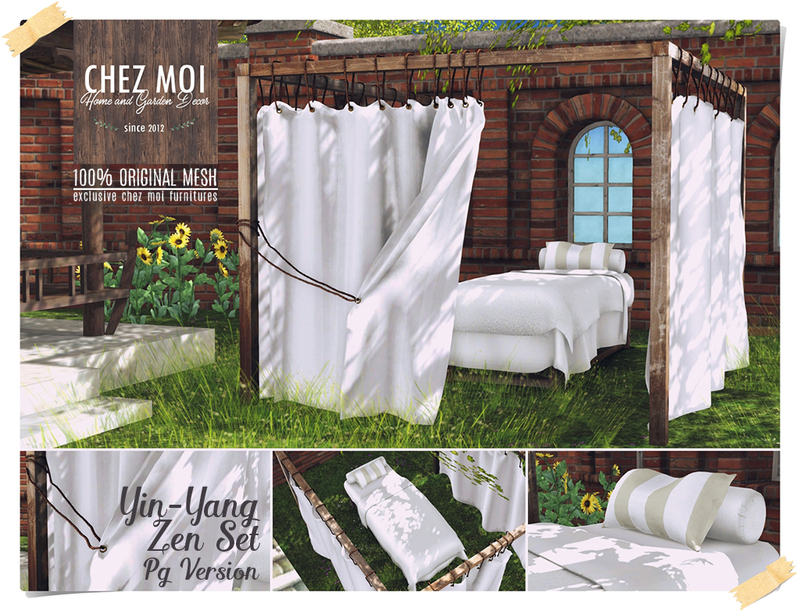 Entice your love with this sensual bed, fully interactive and ready to make your desire come true. It has 160 animations in Adult version and 72 animations in PG version. 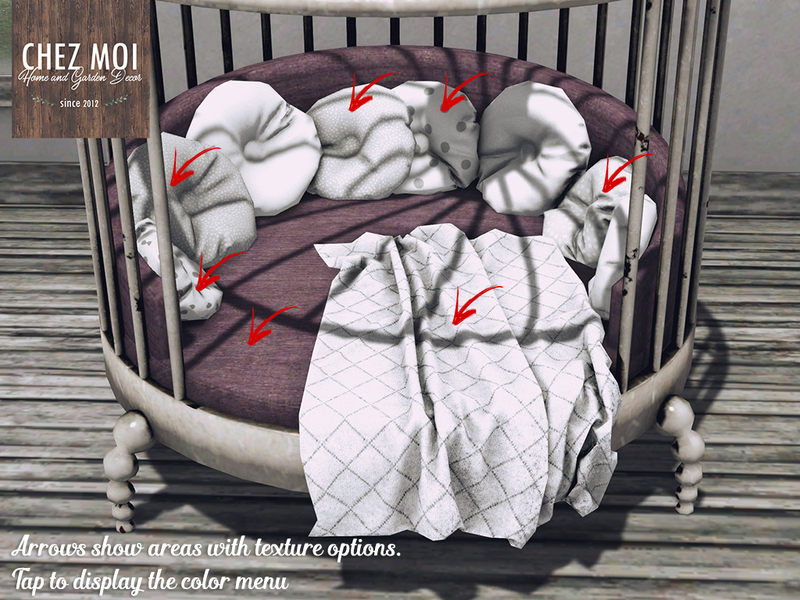 ♥ Texture options menu: 6 colors to choose. 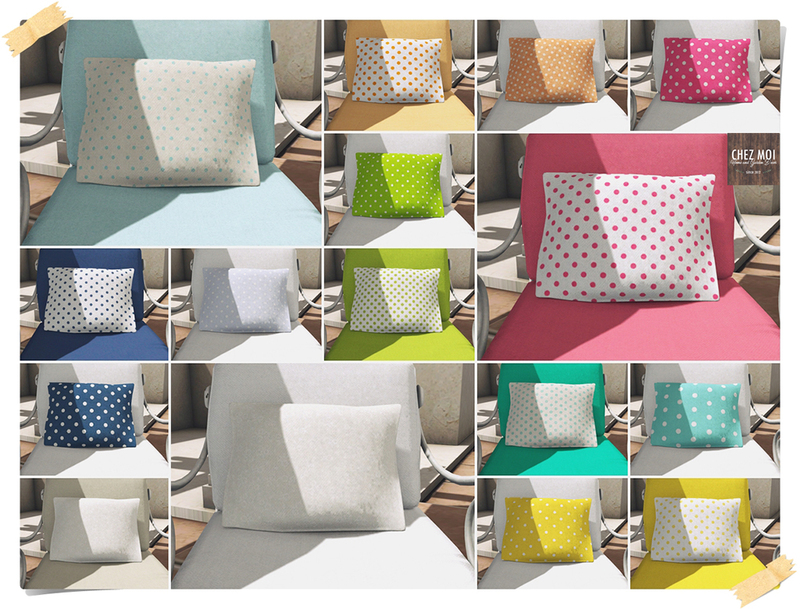 Tap the selected parts to mix colors of the pillows, blanket, and mattress. 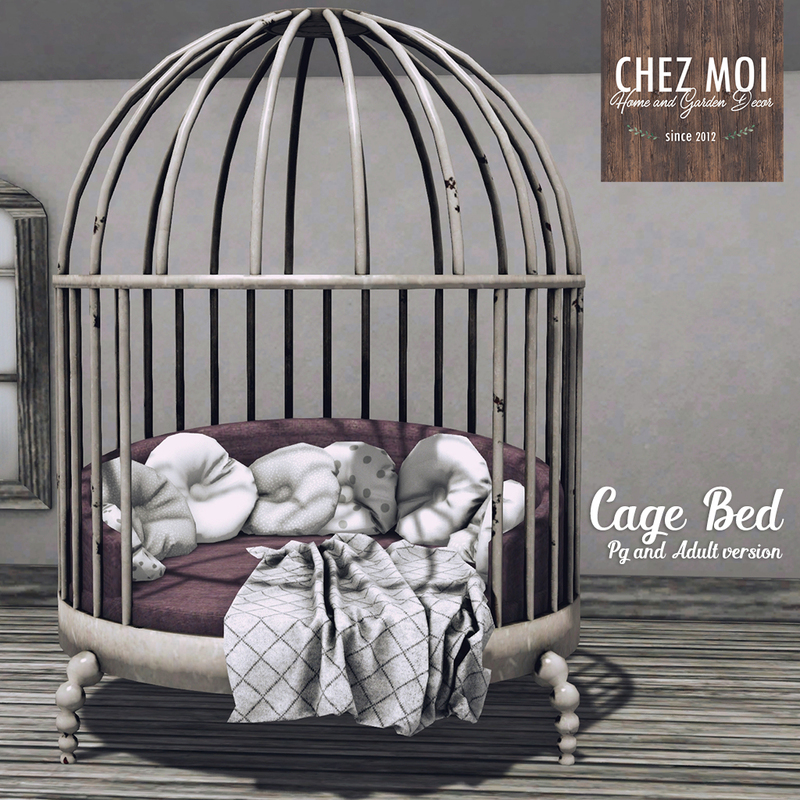 The Cage Bed is available on CHEZ MOI MARKETPLACE, or for a closer look, visit our IN-WORLD STORE.